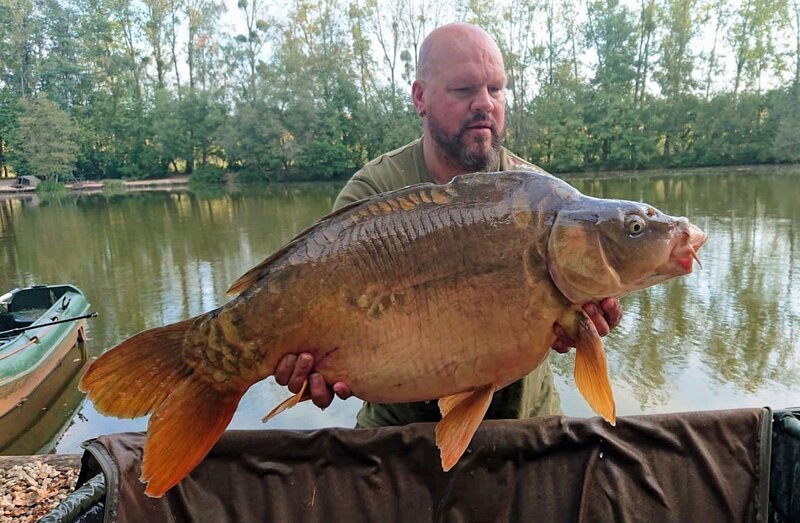 A new lake record mirror, an epic catfish battle, plenty of 30’s and Beausoleil’s biggest bosh: that was a good week then guys! 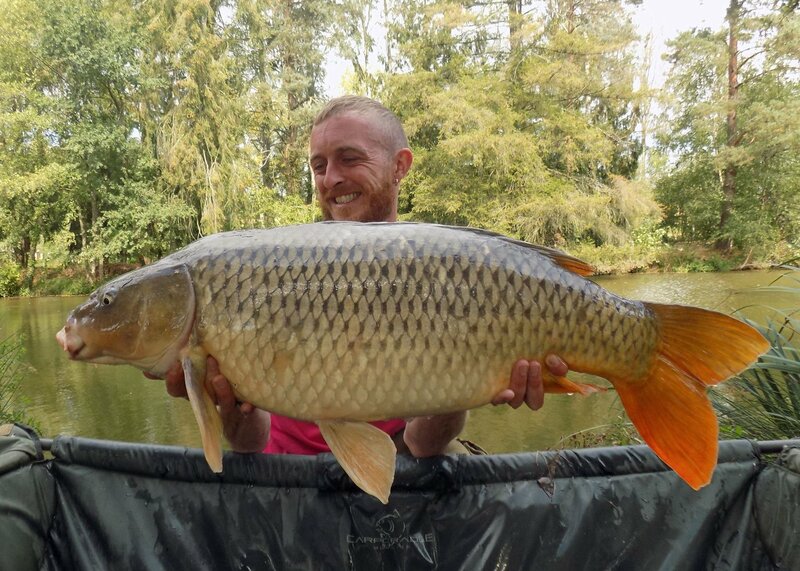 This week we welcomed back some friends for another week of carp chasing, Beausoleil style! Neil and Vinnie first came in 2016 and they’d been looking forward to their return trip for a long time. Perm was over on his 2nd trip in six weeks but that didn’t stop him from bouncing off the walls with excitement to be back at a place he calls home. After a good look round, the guys put a plan of attack together. Vinnie went for the Big Double and Neil plumped for Point ‘C’ as he’d fished Island Point last time. Perm went for the Home swim which hadn’t been fished since he was last here and remains the least favoured of all our swims. After a long period without any time off work, it took a couple of days for Neil to properly arrive and get his fishing head on. Tired and wired, it just wasn’t happening for him and none of his knots were passing the unforgiving Kettle Bell test. Knowing how important it is, he kept working at it and the pass rate increased. For the first few days it was head scratching time and at one point he even considered taking up golf! Desperate times but then, on Tuesday night, things started to fall in place, the old skills returned and he started to put the pieces of the jigsaw together. After banking a nice upper twenty common, he got his 2nd take of the night from an open water spot at nine wraps. At first he was pretty sure he was into a catfish as he’d connected with something large, slow and ponderous. 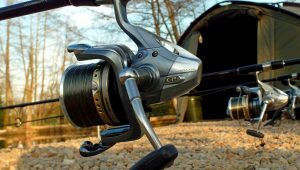 It comfortably held station not far from where it’d been hooked and despite the 3.5lbs rod taking on a decent battle curve it didn’t budge much! The fight wasn’t spectacularly eventful but slowly the sustained pressure told and something large and weighty circled under the tip for a good while, unwilling to reveal itself. The netting went smoothly but Neil didn’t realise what he’d caught until he tried to lift it out of the water with the sling. Mr. Angry was in mint condition and had obviously been annihilating bait as he’d been successfully clearing anglers out of many kilos while dodging every rig he’d come across! 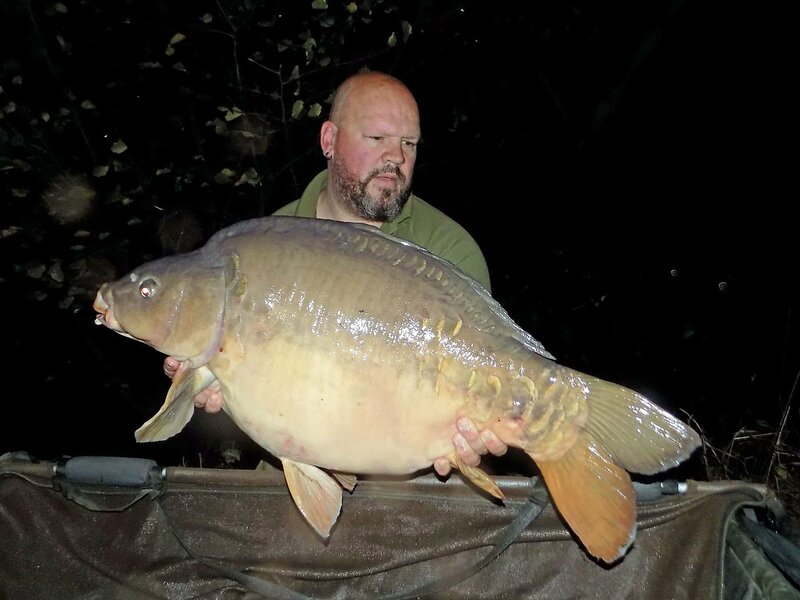 Last trip Vinnie banked plenty of fine specimens including the highly prized Big Apple at 33lbs 8oz which then became his new PB. This trip would see him break it once more with a mirror of 34lbs and then again another mirror of 37lbs (Gerrard). 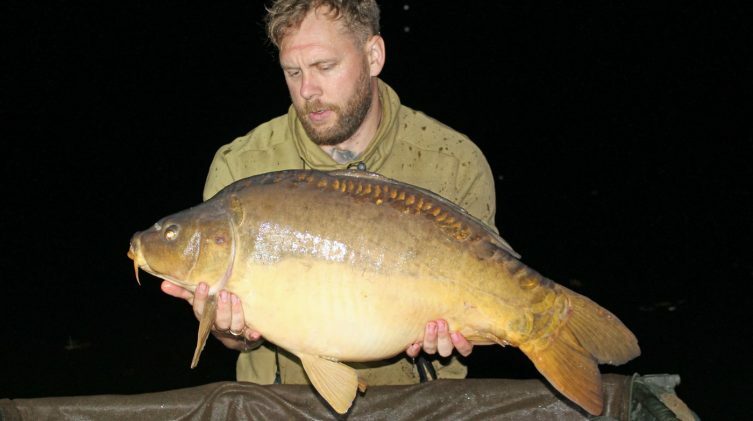 Apart from a bit of a dry spell midweek, Vinnie caught most nights and found a mixture of open water and marginal spots produced the goods for him. Vinnie went with plenty of our fabulous fishmeal (Shrimp & Crayfish) and fished matching glugged double bottom baits on the rig . To make the bait budget go further, Vinnie also used a less expensive fishmeal for freebies and got through 20kg of boilies in total, the same as Neil. 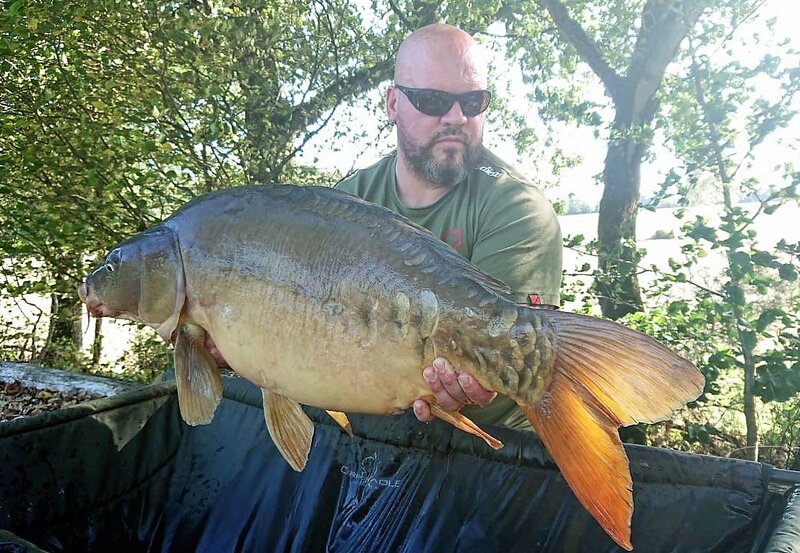 Vinnie did everything right, he found the features from the boat, rowed out the rigs to be right on the money and found a new spot in Catfish corner which produced one of his PB carp. It was great to see. He worked hard at his fishing as well as being head chef to the boys. Beausoleil is a small piece of angling paradise. Vinnie had the fight of his life from one of our cats that picked up his 2 x 20mm bottom baits from just off the Island point. Last trip Vinnie made it into the prestigious three figure club with a 100lb specimen so he’s not exactly a stranger to big powerful catfish! 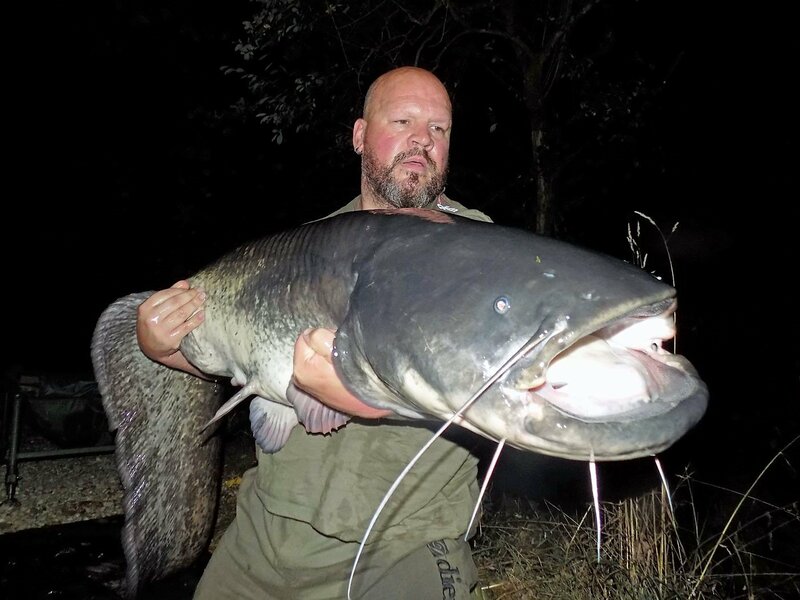 Now I’m sure Vinnie won’t mind me saying that he’s a big lad and fit with it but this catfish hauled him round the swim like a cat would toy with a mouse! Vinnie was “in bits” afterwards and came back to the house for a few hours to recover! Inspecting his rig after the fight, Vinnie was shocked by the state of his swivel: the eye was now oval shaped and one of the legs had virtually popped out the barrel!! Amazing to think this became the weak point of the system. 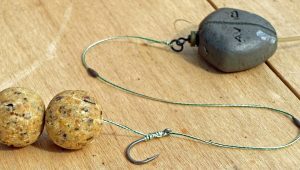 Carp swivels are designed to be good for 40lbs so there’s no way that they should fail before the 25lb mainline but I’ve seen it happen before and Vinnie came well close to suffering the same fate. This turned out to be the only catfish take of the week, but with good gear, good line and good knots, Vinnie played it like a pro. Big thanks to Perm as well who wound in all his rods from the Home swim, grabbed his chesties and hopped in the water to scoop it up in the new catfish sling. Perm’s not so long in the leg department and he nearly had a wader full when he lost his footing on the rocks in front of the Big Double. Despite the 5ft long sling, this cat was so long in body that Perm had to fold the tail in! Perm was horrified to see the barbless hook fall out in the final stages but fortunately he’d got him safely contained and he wasn’t going anywhere. Good team work guys! Vinnie really liked the mechanics of the “ya-ya” rig I showed him on Monday and he stuck with it for the rest of the session so they accounted for both his PB carp and the catfish. This rig works well at the moment for both species and I can’t wait to have a crack with it myself this winter. After a quick chat about who’d fished where and what the fish had been up to, Perm wasted no time and set up camp again near Home swim where “the water is as spotty as a dalmation puppy”! It’s complicated out there with very rapid changes in bottom type and certainly not a swim for an inexperienced angler, especially with the additional hazards of the bridge and the aerator! The key to success there is to stay off the gravel path and to fish through the undergrowth along the margin. The fish are easily spooked in this shallow area but as long as the water temperature is high enough they love hanging out here. I’m sure the fish consider it a safe zone due to the lack of lines in the water. Fishing very accurately, locked up and mega slack is the way forward and Perm fished it like a pro. Perms stuck to his favourite method of small traps and targeting showing fish. In fact his lines were never in the water until he’d actually seen a fish to fish to. It worked like a charm and the takes usually came quickly after setting the trap. Most of Perm’s carp came on simple hair rigged popups fished in solid or parachute bags. 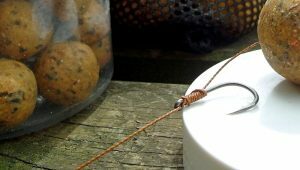 He found that his popup hooks stayed sharper for longer than his bottom bait rigs did which is an interesting observation. 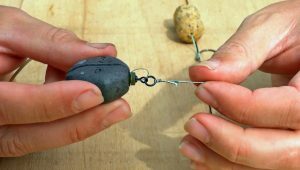 95% of the time I fish with bottom baits and as I hand sharpen every time it’s not something that bothers me but as hook sharpness is everything here, it’s certainly food for thought. At the start of the week Perm rowed his rigs out but he’s fabulously accurate with his casting so with a number of carp under his belt and swim knowledge growing day by day, he was soon flicking PVA traps out to showing fish over these small spots with pinpoint accuracy day or night! Not content with catching fish from his own swim he couldn’t resist flicking a rod out from the channel swims when it seemed right for a bite and he picked up one extra carp for his efforts. From the outside, Perm can give the impression of someone not fishing. He loves the chat and the social and his rods are out of the water most of the time. It’s not that he’s not fishing, he’s just biding his time and looking for the next bite, that slight shift in the weather that he’s so acutely aware of that tells him where to fish and when. When this time comes, he’s off like a rat down a drain pipe to get a rig in play and it’s usually not long before he’s bagged one! 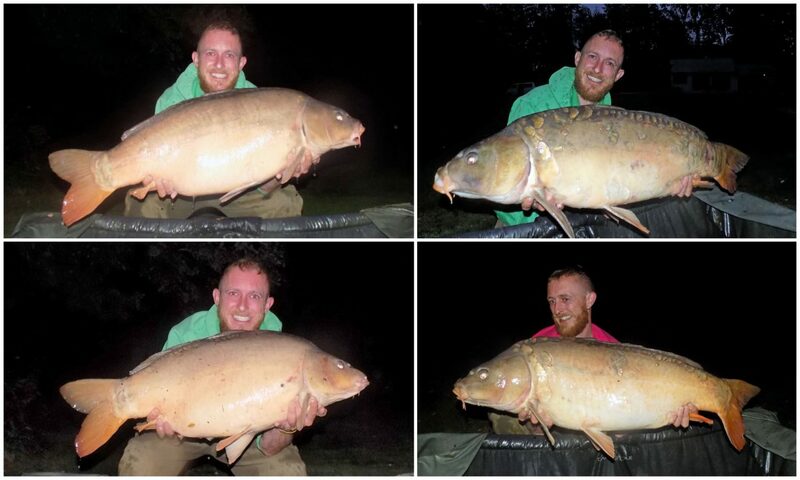 He’s developed his own way of fishing over many years and sleeps very little at night and yet again he’s had a very successful session with 5 x 30’s to 38lbs and top rod for the week with 7 fish. Great work mate! 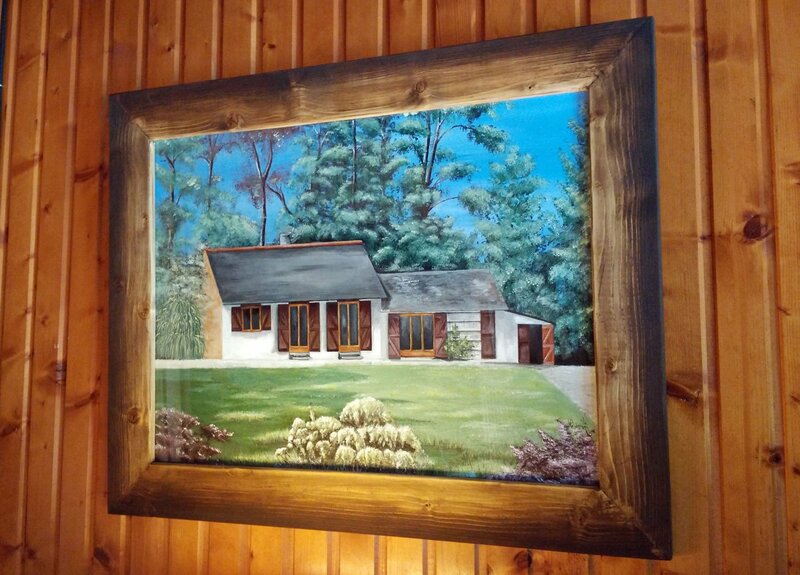 Vinnie is a very talented man and we’re very honoured to receive this beautiful painting of the lodge. It’s a super piece of work, complete with a custom frame. We’ve given it pride of place in the lounge and I’m sure it will be enjoyed by all our visitors over the years to come. Thanks ever so much mate. After listening to some absolute hippos lumping out night after night in front of his swim, Neil couldn’t resist joining them and did a running somersault into the lake! That is a spectacular way to end a great holiday! As always, Beau has produced a cracking week, whether it’s the fishing, the social with the lads, the accommodation or Matt and Ren coming down doing their thing and taking the time out to chat about how you’re getting on. Honestly, Beau has the full package. Matt and Irène are generous, genuine people who only want the best for their guests and I think it’s safe to say we now consider them friends. Beau is a small piece of angling paradise.